Is General Anesthesia Use Safe In Oral Surgery Offices? General anesthesia (aka “deep sleep”) is used in many types of surgeries to alleviate pain, cause memory loss, limit patient movement, and reduce anxiety while keeping the patient asleep, safe, and comfortable. Oral & Maxillofacial Surgeons (OMS) have been administering in-office general anesthesia for decades to patients for procedures such as wisdom teeth extractions, dental implant placement, facial cosmetic surgery, and jaw fracture repairs. The same standards of care are followed in the OMS office as in the hospital settings for anesthesia care. 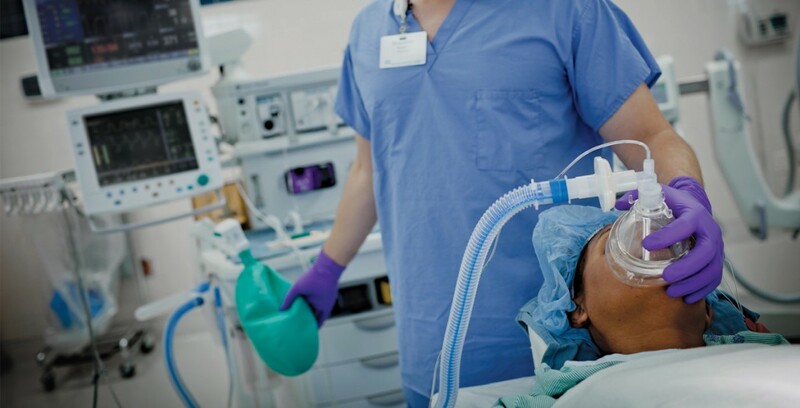 Monitoring equipment such as EKG leads, pulse oximetry, blood pressure cuffs, temperature probes, and capnography are used on all patients under anesthesia. All patients are properly assessed and the appropriate anesthesia level is chosen with input from the patient and surgeon. On October 16, 1846, Dr. William Thomas Green Morton (dentist) administered diethyl ether vapor (general anesthesia gas) to Edward G. Abbott for excision of a neck mass by Dr. John C. Warren a surgeon. The success of the general anesthesia gas in this case went “viral.” Although the true credit for successfully administering general anesthesia should go to Crawford Long in 1842, the occasion was not published. The successful use of the general anesthesia gas in humans spread quickly throughout the world and changed surgery forever. Many patients do not realize that OMS residency includes at least four years of anesthesia training along with the other surgical training. Four to six months of residency training is spent in the actual Anesthesiology Department of a hospital administering general anesthesia to patients for various surgical procedures ranging from open heart surgery to baby deliveries. OMS residents routinely manage the ventilators or machines that breath for the patient while asleep. Airway management training is essential in anesthesiology. OMS residents learn to perform tracheostomies, cricothyrotomies, and proper placement of several intubation tubes (LMAs, endotracheal tubes). Moreover, proper use of all emergency, life-saving medicines is also taught. Several standards must be passed before graduating consisting of Basic Life Support (CPR), Advanced Cardiac Life Support (ACLS), Advanced Trauma Life Support (ATLS), and Pediatric Advanced Life Support (PALS) training. All oral surgeons must obtain a state-issued general anesthesia permit prior to entering private practice and administering general anesthesia to patients. OMS membership societies (AAOMS) also set benchmarks that are usually higher than the state standards of care. Oral surgeons usually try to obtain board certification in oral surgery (American Board of Oral & Maxillofacial Surgery — ABOMS) and some even obtain board certification in dental anesthesiology (National Dental Board of Anesthesiology — NDBA) to reassure their patients of competency. Before general anesthesia is administered, a pre-anesthesia assessment is completed. This assessment is usually done a few days before the scheduled procedure but can be done the same day if the patient is healthy and prepared for the general anesthesia. The patient completes a health history form and is examined by the surgeon and anesthesiologist prior to surgery. At that time, any tests such as blood labs, x-rays, or medical clearances from other specialists can be obtained. Many patients are frightened of going to sleep, but the fear stems from a lack of knowledge. Therefore, proper patient education is the key to a successful general anesthesia experience. Many OMS offices have Informed Consent Videos that patients must watch prior to procedures under general anesthesia. These videos help to properly educate patients, raise questions that can be asked to the surgeon / anesthesia team prior to the procedure, and help to alleviate apprehension. ASA 1- A normal healthy patient. ASA 2- A patient with mild systemic disease (pregnant, smokers, well-controlled diabetics). ASA 3- A patient with severe systemic disease (alcoholics, heart disease patients, poorly controlled diabetics or high blood pressure patients). ASA 4- A patient with severe systemic disease that is a constant threat to life (severe heart disease, kidney dialysis patients). ASA 5- A moribund patient who is not expected to survive without the operation (life threatening trauma — gunshot wound to head, extreme blood loss, drowning). ASA 6- A brain-dead patient (donor). Do not eat or drink 6–12 hours before surgery under general anesthesia to prevent aspiration (fluid or food debris transfer to the lungs). The anesthesiologist must know a patient’s complete medical history including all past surgeries, any contagious or life threatening illnesses (ie. HIV, Hepatitis C), any complications with previous anesthesia, any food or drug allergies, names of all medications and vitamin supplements taken, any use of illegal drugs or alcohol, and family-related health problems (ie. malignant hypothermia history). BE HONEST WITH YOUR ANESTHESIA TEAM BECAUSE ONCE ASLEEP WE CAN NOT ASK QUESTIONS! The possibility of an anesthesia-related death in the United States is currently 1 in 1,000,000. A patient is more likely to be hit by an automobile than to experience an anesthesia death! Dr. Taylor practices full scope oral & maxillofacial surgery in Jackson, TN. He owns the Mid-South Dental Implant & Oral Surgery Center, PC.